This work includes Foreword by Nigel Sykes, Medical Director, St Christopher's Hospice, London. This practical, evidence-based guide has been specifically designed for teachers in cancer and palliative care. 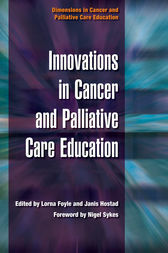 It is completely up-to-date and covers the recent complex changes in cancer and palliative care delivery, offering a range of different, creative approaches. Ideal for training, the text includes highlighted key points, self help questions for reflection, and references where applicable. It provides invaluable guidance for all healthcare professionals with palliative care teaching responsibilities, including undergraduate and postgraduate healthcare educators and Macmillan lecturers. '[This] book gives us a three-dimensional view of how to respond to the demands on cancer and palliative care education today, set particularly in a British context but, of course, capable of extrapolation to other settings. These three dimensions of innovation can be summarised as: What do you teach? How do you teach it? To whom do you teach it? Innovation in all three aspects simultaneously may be difficult to achieve, but all who have a responsibility for education are faced with the challenges of making their teaching more effective (and demonstrating that they have done so), keeping abreast of advancing knowledge and clinical practice, and of reaching out to groups of learners who hitherto have been neglected. Of significant help to anyone in this field whose concern is the delivery of effective and appropriate education.' - Nigel Sykes, in the Foreword.